Hello. Thank you for this tutorial. Everything went fine up until I tried to add the “Second floor” … its showing up as GSW on the homepage and when clicked there’s no item in the list at all. I am using the latest version which may be different from yours. Please let me know if/what I need to do different because I copied exactly what you stated here and no dice. Also do you mind replying back with an email or some other form of contact? Im trying to setup a way to control a few lights and was hoping you could give me a few more ponters. Thanks again! I would be happy to help. 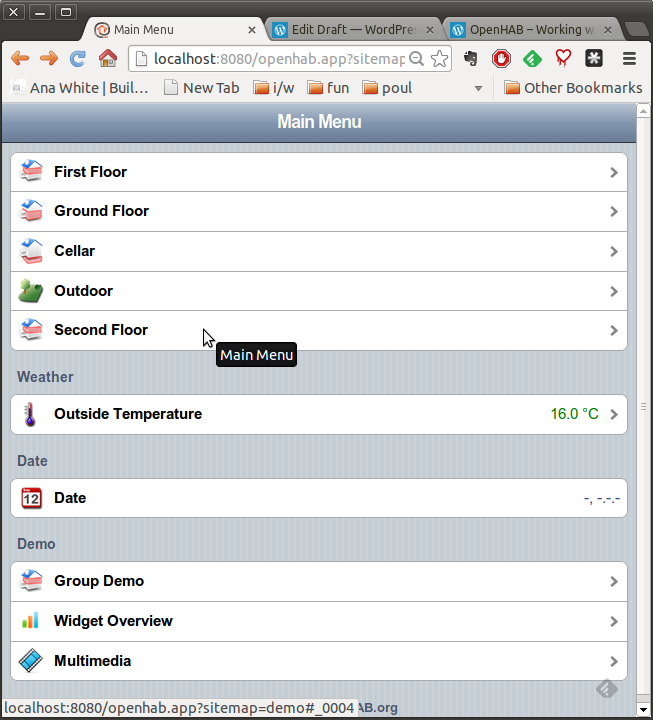 What is the version of Openhab you are using? 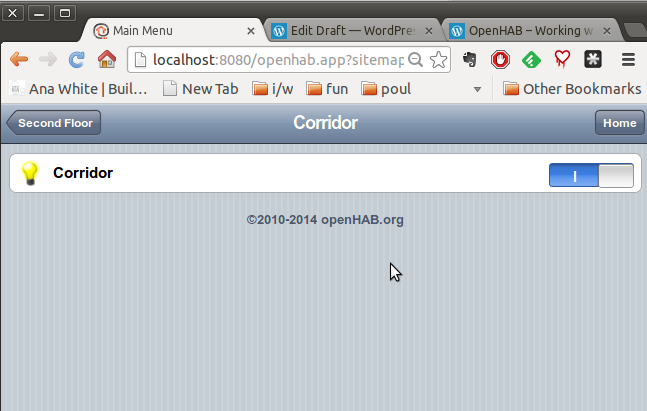 sgi> 19:51:54.109 INFO o.o.c.internal.CoreActivator[:61] – openHAB runtime has been started (v1.5.1). 19:56:32.581 WARN o.o.c.t.i.s.MapTransformationService[:70] – Could not find a mapping for ‘-‘ in the file ‘en.map’. 19:56:35.847 WARN o.o.c.t.i.s.MapTransformationService[:70] – Could not find a mapping for ‘-‘ in the file ‘en.map’. 19:56:49.359 WARN o.o.c.t.i.s.MapTransformationService[:70] – Could not find a mapping for ‘-‘ in the file ‘en.map’. 20:00:01.114 WARN o.o.c.t.i.s.MapTransformationService[:70] – Could not find a mapping for ‘-‘ in the file ‘en.map’. 20:05:00.801 WARN o.o.c.t.i.s.MapTransformationService[:70] – Could not find a mapping for ‘-‘ in the file ‘en.map’. 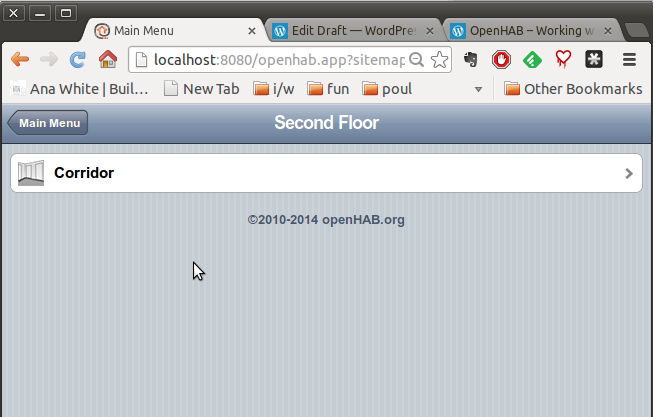 osgi> 23:11:46.622 INFO o.o.c.internal.CoreActivator[:61] – openHAB runtime has been started (v1.5.1). 23:14:01.283 WARN o.o.m.i.i.GenericItemProvider[:108] – Attempted to register a second BindingConfigReader of type ‘gpio’. The primaraly reader will remain active! Could you provide any kind of help here??? I was hoping you could since I followed your tutorial step by step. It appears that the distribution you have picked up has an issue. Raspberry Pi would be the last thing to suspect so, can you give me your distribution. I can try it on my Pi. I have the same model B.